Compatibility : Compatible for 38mm/ 42mm apple watch all models, Series 1, Series 2, Sport Edition, Nike+, HermÃ¨s. The classic silver style perfectly fits for girls or women, makes women more attractive and feminine, men is also suitable. Suitable for many occasions, such as wedding, formal events, working, shopping, or other daily events. Premium High Qualityï¼This band made by premium selected 316L stainless steel. Not only guarantees the durability but also presents excellent glossy finish, integrate practicability with fashion naturally. Premium stainless steel metal features fashion, luxury, nobility, elegance & durability, not get rusty and corrosion-resisting, So it guarantees a long-time use life. Artistic and Casual Style Designï¼The unique design with fine artificial jewelry rhinestone embedded make the strap more beautiful, bright, luxury, gorgeous, exquisite and advanced, which was created with an ideal companion for women who are seeking a fashionable, affordable, casual watch strap that will keep in popular for many seasons and places. Precise Connectors and Artistic Craftwork: Exquisite workmanship to ensure flexible joint, bring you a comfortable and unparalleled wearing experience. Precise Connectors ensure the stability and security for your apple watch. Suitable for 5.1- 7.5inch /13-19cm wrist size. Band length can be adjustable. 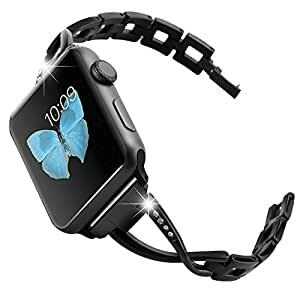 Perfect Gift: This band can definitely turn your Apple Watch into a great work of art and make you stand out from the crowd. It is usually the perfect choice for Thanksgiving, Christmas, Valentine’s Day, Anniversary and Birthday present. Durable, comfortable, breathable,and corrosion-resisting, not get rusty, a high quality texture. Exquisite workmanship to ensure flexible joint, bring you a comfortable and unparalleled wearing experience. Each Stainless steel piece is suitable size and pieces together with scientific gabs. Suitable for wrist size: 5.1- 7.5inch /13cm-19cm. Band length could cut short in any local watch repair stores or DIY with the new-design reused watch band link cut tool. We provided 1 year warranty for a non-artificial damage. Package include: a metal band and a removal tool. Watch or tracker is NOT included.